* If certification training is outside of Metro Washington DC area, there may be an additional cost for travel and other expenses. ** Plus tax, where applicable. 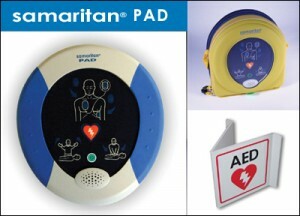 Initial CPR/AED Certification Training for group must occur at same time, and is in classroom format. Additional students and additional classes available at an additional cost. CPR/AED Certification valid for 2 years from date of training, and is through American Safety and Health Institute (ASHI). Package available without training component for $2295. If delivery of device is outside of Metro-Washington area, actual shipping charges will apply. Local office point of contact required for establishment of AED Management Program. Offer void where prohibited by law. Please contact us if you have any questions, or if you wish to order! We also offer a full catalog of other Automatic External Defibrillators, along with parts and supplies. Packages are also available that include additional devices, training, and all items are available ala carte, as well. If you are interested in a specific device, or additional pricing, please contact us for more information.